I'm trying my hand at hay-grazer for the first time. Our rye did nothing due to not having any rain on it for dang near 6 months, so I really need this stuff to produce. I'm going to mix it with about 6-8 lbs per acre of cow peas. 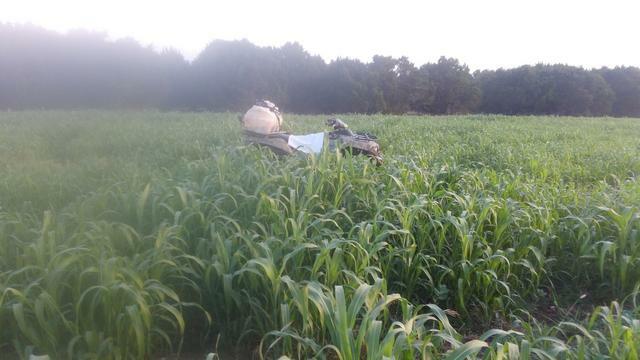 I also put down about 100 lbs per acre of nitrogen about 3 weeks ago, then we got no rain again until last night. I've got about 45 acres to plant. I'm hoping to have enough time to get it in the ground later this week, no later than Saturday, if the weather and my regular work schedule cooperates. We are supposed to get another round of rain Sunday night. Any suggestions from anyone who has grown the stuff before? 100 lbs of actual nitrogen? How much was put down for the wheat crop? This got out of the ground a week or two into April. I've got several later plantings up to last weekend. It is getting late imo . But it really doesn't take alot of rain. Just definitely try to get it in ASAP. I would forget the silly peas. If the haygrazer goes it will choke out anything else anyway. Nothing wrong with 100 pounds of nitrogen as long as you get rain. How many pounds per of seed do plan on? That sure is pretty, Fence. How much are they getting for haygrazer seed? ClinchValley wrote: That sure is pretty, Fence. I'm planting today. I'm going with about 30 lbs per acre. AZAggie wrote: I'm planting today. I'm going with about 30 lbs per acre. For hay and the amount of fertilizer you put down. I would at least double that. callmefence wrote: This got out of the ground a week or two into April. I've got several later plantings up to last weekend. It is getting late imo . But it really doesn't take alot of rain. Just definitely try to get it in ASAP. I would forget the silly peas. If the haygrazer goes it will choke out anything else anyway. Nothing wrong with 100 pounds of nitrogen as long as you get rain. How many pounds per of seed do plan on? Is that broadcast and disced in fence? I planted a few acres in Johnsongrass a week ago. Hoping the rain we are getting gets it up and going. I think it should work very well for my needs. Did you decide to go with any JG this year? I've done discing but the drill does such a better job. Same with oats. I spread some that we pulled by hand last summer on the river. We went to go night fishing and caught bait early. I had about half a five gallon bucket. 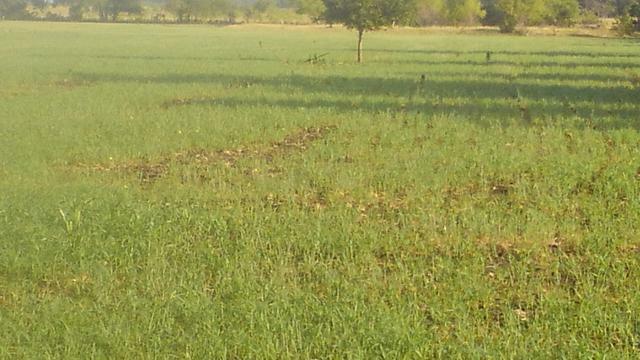 I planted it mixed with haygrazer on a different field. The field is up maybe four inches. I won't know if the Johnson grass stuck till it starts heading. If it took I'll let it go to seed. So no I really didn't do Johnson grass This year lol. Allenw wrote: 100 lbs of actual nitrogen? How much was put down for the wheat crop? No wheat. A little rye that got plowed up. The drought here decimated it. Wasn't enough to bale. I didn't want to risk planting that early here. In April we were still having mornings in the 20's. Even worse, we hadn't had any measurable rain since the first week of October. I may be one of the first in the area to get it planted, although I don't see a lot of it around here normally. Different field just up maybe two weeks. It'll come up pale and yellow and go slow until about this size. Then if the weather is right it can be belt buckle high and deep green in about the same amount of time. Mine was 32 this year. You need some P and K to go along with N for a new planting....if it's not already in the soil you need to incorporate it in the root zone before planting. N top dressing on a growing plant is ok, but you have to get it growing first.....ref. Agricultural Research Center at Renner (Texas), joint operation of TAMU research fellows and local businessmen formed back in the '60's to get Texas crop production going again after "king cotton" almost wiped us out. I harvested a field of Austrian Field peas and Jumbo Rye this spring at about 30" tall and very thick. The peas used the rye as a trellis is the reason they were up so tall. Otherwise they would have hugged the ground and been a tangled mess....but that's ok. A tangled mess chops up just fine. I came right back with SS and it's up about 8" now and nice and green, no additional fertilizer. The peas died off but probably 60% of the rye clumps recovered even though I ran a 3 pt rototiller over the field between crops and did a good job of disrupting the rye. Rains came at the right time and it is back strong with the SS. Interesting watching the SS plants. They were showing tomato worm green till the roots got long enough to find the N nodules left by the peas...then they turned a pretty Kelly Green. Texasmark wrote: You need some P and K to go along with N for a new planting....if it's not already in the soil you need to incorporate it in the root zone before planting. N top dressing on a growing plant is ok, but you have to get it growing first.....ref. Agricultural Research Center at Renner (Texas), joint operation of TAMU research fellows and local businessmen formed back in the '60's to get Texas crop production going again after "king cotton" almost wiped us out. Which is the general recipe in this area. I double crop oats and crimson clover on the same ground over the winter. You must be in the southern tip of the Blackland (clay) belt I'm in. We soil test high for K but the general consensus of opinions is that even though it's in the soil and tests as such, getting it in a suitable state for plant consumption is the problem. I don't know about all that. Since you are running 0% K, you must be able to use what K you have. 30-10-0 would be a good combo I just might try one of these days to see if the K availability thing is fact or fiction. You'd think after having this farm since 1979, I would have tried it by now....no guts. Grin. Maybe I need to toughen up a bit.